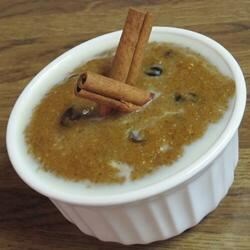 "This Indian pudding is a surprising mix of milk and corn meal. It is excellent served warm with vanilla ice cream." Preheat oven to 325 degrees F (165 degrees C). Grease a 1 1/2 quart baking dish. Scald 3 1/2 cups of milk in top of double boiler over direct heat. Remove milk from heat. Mix cornmeal with remaining 1 cup of milk, and stir this mixture into the scalding milk, stirring constantly. Place the milk mixture into the top of the double boiler and cook for 20 minutes, stirring frequently. Stir butter, molasses, salt, sugar and cinnamon into the mixture. Pour into the prepared baking dish. Bake in the preheated 325 degrees F (165 degrees C) oven for 1 1/2 hours. Overall a nice, easy recipe. I liked the taste, too! I LOVE Indian Pudding and so few people know about it. I cook it long and slow in the oven. Serve with a scoop of vanilla ice cream. A classic dessert featured at Boston's Durgin Park restaurant.